Kushinagar (also spelled Kusinagar or Kusinara) is considered one of the most sacred Buddhist sites. It lies between Lumbini and Sarnath, near Kasia a rural town in Uttar Pradesh State. It is 52 km from Gorakhpur. A large number of followers of Buddhism from India and abroad offers special prayers at Kushingar everyday. It is one of the four major pilgrimage sites said to have been designated by Gautama Buddha himself. Besides, Kushinagar, the other three sites are: Lumbini (birth); Bodh Gaya (enlightenment); and Sarnath (first teaching). It is believed Kushinagar is the place where Gautam Buddha attained Mahaparinirvana (salvation or the release from the endless cycle of birth and rebirth more than 25 centuries ago) with the last words," Behold now, brethren, I exhort you, saying, decay is inherent in all component things! Work out your salvation with diligence!". A temple dedicated to the event - The Mahaparinirvana Temple is the main tourist attraction in Kushinagar. Since the Mahaparinirvana of Buddha, Kushinagar was turned into a memorial site. Kushinagar was known as Kushawati or Kushinara and it was a part of the Malla kingdom. According to the Valmiki's Ramayana, the Mallas was earlier part of Kosala region in India. Kushinagar is also referred as the land of Kusa, son of Rama. The place was once the flourishing capitals till the 12th century A.D. Many of the ruined stupas including the relic stupa Mukutbandhana and Gupta period Chaityas and viharas at Kushinagara date back to 3rd century BC to the 5th century AD when prosperity was at its peak. 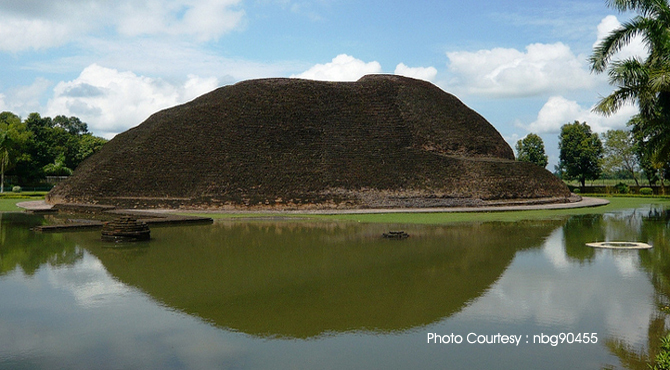 The Mauryan emperor Ashoka is known to have contributed to significant construction at this site. The Chineese travellers Fa Hien, Hieun Tsang and T.Ising visited Kushinagar during different centuries have mentioned Kushinagar in their travelogues which later fell to bad times due to lack of patronage. During the 19th century Sir Alexander Chunningham, the famous archaeologist, excavated and exposed the remains of Kushinagar. The visiting sites of Kushinagar fall in three sections. a) Mahaparinirvana Temple - Built in the traditional Buddhist architectural style, it is a single room temple believed to be built around the fifth century. Built on the same place where Lord Buddha had attained Mahaparinirvana, the temple houses the statue Lord Buddha in the reclining state. It is a 6.10 meter long statue and it was unearthed during the excavations of 1876. Carved from Chunar sandstone, an inscription below dates the statue to the fifth century; b) Mata Kunwar Shrine contains a 10th Century, stone image of Lord Buddha in the 'Bhumi Sparsha Mudra' (earth touching posture) under the 'Bodhi tree' and c) Rambhar Stupa, which is supposedly the spot where Lord Buddha was cremated and his relics divided into eight equal parts. The surrounding park is dominated by long tailed langur monkeys. It is a huge brickwork stupa, excavated by Carlyl in 1876. Stands at a height of 2.74 mtr, an inscription in ancient Brahmi here stated that Lord Buddha's remains had been deposited here. It contains the items found from the site excavations at Kushinagar. Opening Time: 10:00 am. to 5.00 pm. Monday is holiday. This is a huge temple complex built in the typical Thai Buddhist architectural style. Apart from this, a Chinese Temple which attracts the devotees for its distinct and exquisite architecture and a beautiful statue of Lord Buddha, a Buddhist Temple, a Japanese Temple which has a beautiful statue of Lord Buddha made of asthadhatu (eight metals), a Tibetan Temple and the Indo-Japan-Srilanka Buddhist Center hold significant religious value for pilgrims.